In the era of North Song, Chu Chen’s Heavenly Stem Adoption method uses the ‘Combined 10’ in Bagua to explain such theory. He uses the 10 days diagram to dictate the early days Bagua locations, which is influenced by Shao Yong’s early days diagram. The 55 heavenly and earthly numerology. This rigid matching of Shao Yong rational of Kap (1), Yuet (2), Peng (3), Ding (4), Mou (5), Kei (6), Kang (7), San (8), Yam (9) and Kwai (10), with Kin adopts Kap (1) and Yan (9), Kwan adopts Yuet (2) and Kwai (10), Chan adopts Kang (7), Ham adopts Mou (5), Lei adopts Kei (3) and Tui adopts Ding (4), Kan adopts San (8) can’t seem to put into practical framework and for further development. Later, many scholars found this rigid explanation can’t be explained in reality let alone the applications; the unexplainable Kuas and numbers further complicate this. I think critics are a bit harsh on this. The Bagua creation and generation is the result of the Solar and Lunar movements. In scientific analogy this is none other than the position of the lunar (location) and the time of the Kua being formed. Some critics think this is not acceptable and some even think this is ridiculous. This newly debatable topic is not something new and can be traced back to the Sang Zhou Oracle encrypted information on Lunar’s movements. This latest discovery is the result of the hard work and precisions details from our ancestors. The late Jin Fang had already implanted the Early and Later Bagua information in the Kuas? Let’s re-examine this hypothetical theory in more simpler terms and analogy. In the year 2008 of period eight, “Lunar Earthly Branch Adoption Theory’ once again is glorified. Kin adopts Kap and Yan, Kwan adopts Yeut and Kwai, Kan adopts Peng, Tui adopts Ding, Ham adopts Mou, Lei adopts Kei, Chan adopts Kang, Shun adopts Shan, Yan and Kwai set at Kin and Kwan. 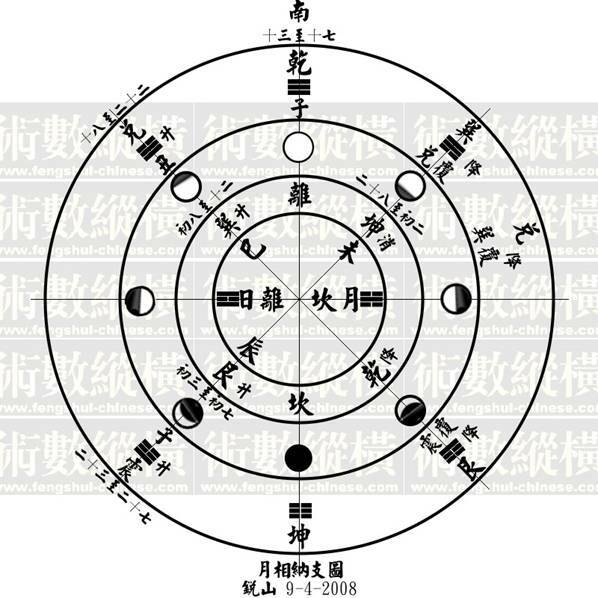 5-elements mutually create and destruct each other, with the earthy branch set as first Yao (first line out of six lines in a full set of Kua) in Kin Kua is Che (Rat), Chan internal Kua sets as Che (Rat), Ham Kua sets as Yan (Tiger), Kan Kua sets as Shan (Dragon), Kwan Kua first Yao sets as Mei (Goat), Shun Kua sets as Chou (Ox), Lei Kua sets as Mao (Rabbit), Tui Kua sets as Ji (Snake). In retrospect such matching of 5-elements and Earthy Branches into Kuas are interrelated. Other implying in connections with Lue Li (an ancient pitch-pipes-basically the musical temperament), that consist of 6 Yang Lue and 6 Yin Li, Jin’s Yi placed emphasis on the Bagua with Yin and Yang, six locations with the matching of 5 elements. ‘The changes of Lue Li resulted the 60 combinations of tones, while the changes of Bagua resulted the emergence of 64 Kuas.’ This breakthrough of 2,000 years’ mystery of Bagua Earthly Branch Adoptions Theory is none other than the lunar movements in accordance to the progressive period of time: Rat, Ox, Tiger, Rabbit, Dragon, Snake, Horse, Goat, Monkey, Roster, Dog, Boar. In the third month of 2008 Xuan Kong Zhang Pai has repeatedly published the Earthly Branch Adoption Theory in relation to the Lunar and Bagua at least 4 times. The relationship between the Early and Later Bagua has rebutted critics with proven and vivid evidences. In the year 2008 of period 8, Xuan Kong Zhang Pai is formed with the principle to help our community. This time we will reveal the technique to public. The interactions of human beings with 5-Stars together with 5-Elements have critical impacts on our life paths. That dictates our quality of life. This unprecedented revelation is to harness the kind energies to our advantage and avoid unkind energies that might bring catastrophe. 5 stars are the Metal, Water, Wood, Fire and Earth respectively. The Metal is also known as “Tai Pak’, The Water is known as “Shen Star’, Wood is the ‘Sui Star’ while Fire is the ‘Yen Star’ and last but not least the Earth is known as ‘Chan Star’. Ancient scholars relate such 5 Stars as The King’s Five Orders. In which will dictate and impact the King’s command. ‘Sui Star’ is wood element with the eastern virtue, the soul of a ‘green dragon’ (normally represent the area of the left side of a house). It has the value of benevolence; it also represents the spring season, day heavenly stems of Kap and Yuet, earthly branches of Tiger and Rabbit. Blossom in spring, steady in summer, and weak in fall while incubates in winter. Strong in east location, with hiccups in South, kaput in the West and recuperates in the North. While trapped in the four storages (implying these particular months) of Dragon, Dog, Ox and Goat. It also represents Chan Kua, liver, foot, sound, and buttocks and stokes related illness. ‘Yen’ fire star sets as south that signifies the soul of ‘rose finch’ (normally represent an area in front of a house). It carries the value of ‘respect or filial’, it also represents summer season, Peng and Ding day stems, horse and snake earthy branches. Incubates in spring, strong in summer, kaput in the fall and trap in winter. That is also true with sectors. In the east sector fire recuperates, strong in the south, kaput in the west and trap in the north. While rather competitive in the months of Dragon, Dog, Ox and Goat. It also represents Lei Kua, heart and eyes. ‘Chan’ earthstar sets as central, the soul of ‘Au Chan’ (normally in the center of a site). It carries the value of ‘trust’. It also represents the last month of each quarter of end seasons. It is the Mou Kei day stems and earthy branches of dragon, dog, ox, and goat (or the 4 storages). It is the Kwan Kua and represents lower abdominal, torso, flesh, fingers, bones, nose and back. ‘Tai Pal’ metal star represents the west sector, the spirit of white tiger (normally represent right side of a site). It carries the value of justice. It represents the fall season, Kang and San day stems, and Monkey and Roster earthy branches. Metal is kaput in the spring, trap in summer, strong in fall and competitive in the winter. Kaput in the east sector, trap in the south, strong in the west while competitive in the north. It represents Kin Kua, head, lung, tongue, army and brutalism. ‘Shen Star’ is water in the North. It is the soul of ‘Xuan Wu’ (normally represent the rear of a site). It has the value of wisdom or wit. It is also the day stems of Yam and Kwai, Boar and Rat earthly branches. It is competitive in spring, kaput in summer; recuperate in fall and strong in winter. Water is competitive in east sector, kaput at south; rejuvenate in west while stay strong and firm in the north. But water trap in the 4 storages month of dragon, goat, ox and goat. It represents the Ham Kua, ears, blood and kidney. To harness the energies from your best element, that particular star needs to travel across your house’s skyline and you should view the star from your living or bedrooms. Get software in the market that shows such movements of stars. You will be able to find out and tracks the movements of such stars and with luck it might travel across your house. Try this one for size; if your favourable element were Wood, then your directions of the movements of such star in the east, southwest and north would be to your advantages. If such star movement is in the west or south then it should be avoided. During spring season in the day of Kap and Yuet if such star in the skyline of east or north then you will be able to get the most desirable result. Likewise if such element is unfavourable to you than a devastating impact might take you to the cleaners!